Have you always wished you could open the door to the Leaky Cauldron and magically end up in the wizarding world? Do you wonder what it’s like to brew your own potions in a Standard Size 2 Pewter Cauldron and then see what happens when you actually drink them? Do you really just want a steaming mug of Butterbeer? Now that Newt Scamander has opened his suitcase again and unleashed The Crimes of Grindelwald in theaters, Potter-mania is heating up like dragon fire again, and you might find yourself wistful for a trip to Diagon Alley. Except there is no such place where you can get Golden Snitch truffles or everything Butterbeer-flavored known to Muggles and wizards alike. 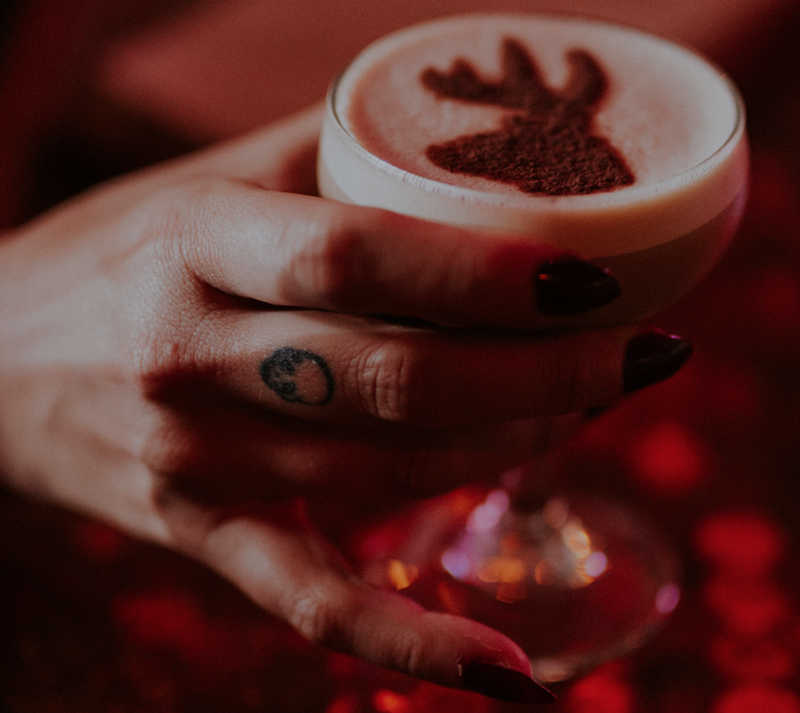 From NYC to the other side of the world and beyond, these unapologetically Potterhead bars and cafés bring J.K. Rowling's wizard-verse to life in a way that you can literally taste without turning into a cat. 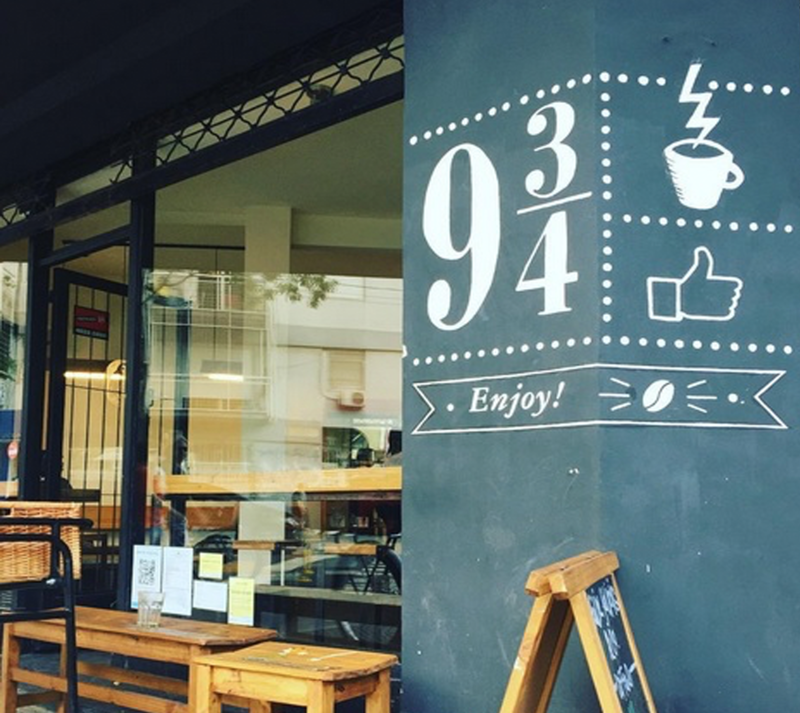 Just the logo for Always Café will make you want to ride your broom to Hanoi right now. The "A" is the Deathly Hallows, the font is the same one used on the book covers, there’s a lightning bolt above the "S," and the café's full name is "Always Coffee and Butterbeer." Because there actually is Butterbeer, along with Felix Felices, Polyjuice Potion, and (legal) Amortentia. Legend says the Butterbeer here is even more delicious than the version you can get at Universal's Wizarding World of Harry Potter. Not only will you think you’ve really found yourself in Diagon Alley once you walk in the door, but the menu looks like a page out of a book of magic, and you can borrow robes and wands and even a Nimbus 2000 to cast Instagram spells in front of your House flag. All the books are on the shelves in case you want to spend hours discussing plot holes and fan theories. That could potentially get more dangerous than a wizarding duel. Oh, and bring your Gringotts gold, because there's a gift shop in the back for all the Harry Potter swag. Whether or not the name of this place is a reference to the Weasleys' owl, Errol, who has a tendency to crash into things, it's probably the closest a Muggle will ever get to the hidden platform. Harry's stack of suitcases sits patiently against one brick wall while a sign directing you to the Hogwarts express hangs from the other. In case you're looking for Hogsmeade, arrows point you to everywhere you'd want to go in the wizarding world. Take your time sipping a caffeinated potion at tables that have been magicked with different Harry Potter-related quotes, like Snape's epitaph, "I must not tell lies," and Espresso Patronum. Someone must have enchanted the coffee. The Dark Enchanter is Bad Owl's own espresso blend with hints of blueberry, strawberry, and milk chocolate. Their signature drink is — wait for it — the Butterbeer latte. In case you can't Apparate to Las Vegas or get there by Floo powder, they now have an online store. Just leaving this here. So what if you're not supposed to drink the potion otherwise known as Liquid Luck every day? While the coffee here might not have any magical properties other than giving you a much-needed jolt of caffeine, the Ministry of Magic isn't going to come after you if you have one too many mochaccinos. Also, the fact that the cups have Hedwig on them is reason enough to stop by here even if you're more into Butterbeer than coffee. 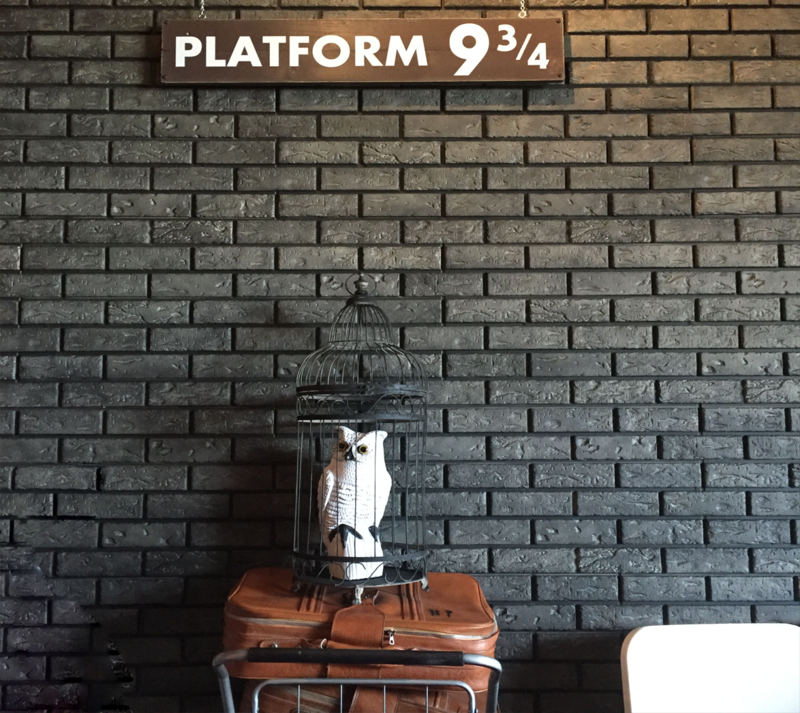 You'll know you’ve come to the right place when you see a sign that says "Wizards welcome (Muggles tolerated)" and another telling you that you've arrived at Platform 9 ¾, next to a steaming mug of lightning. Félix Felices also conjures dessert. 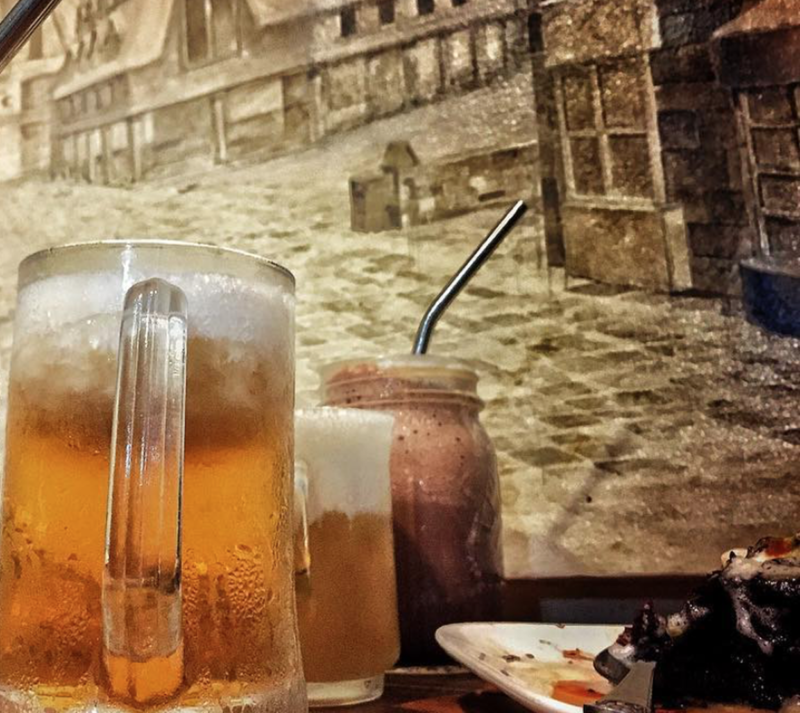 It may not be Florian Fortescue's parlor, but there are some frozen delights to bewitch the mind and ensnare the senses. The espresso ice cream made with their in-house blend sounds like pure sorcery. Also, this owl art on their Facebook page is everything. You don't need to run through a brick wall to get to Platform 1094 (though you will need a round-trip ticket to Singapore). It has the rustic look of the Leaky Cauldron, with a nod to Harry's patronus and his father's Animagus in the form of stags on the chairs. The candelabra hanging from the ceiling might remind you of the Great Hall at Hogwarts. The actual experience is like dining in Diagon Alley. 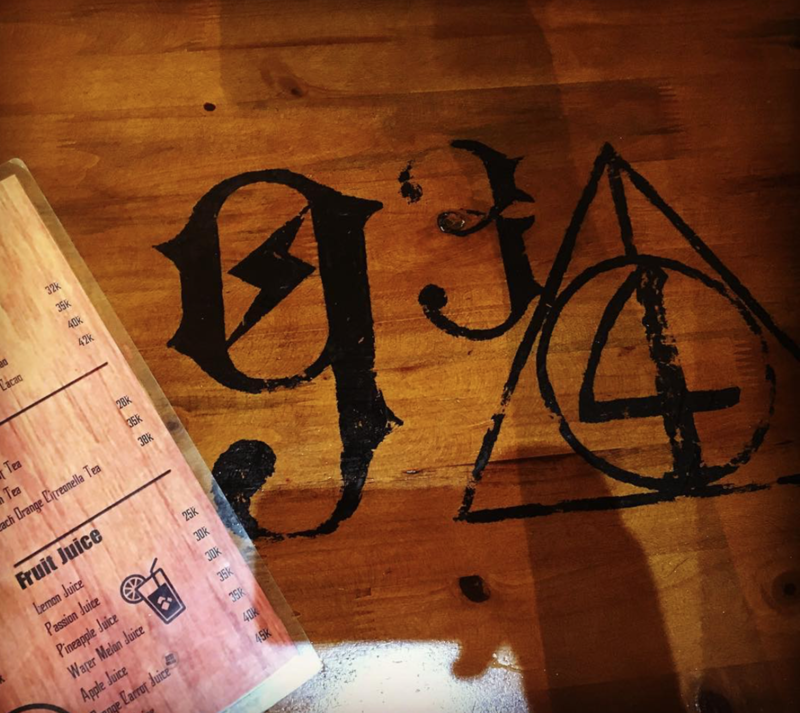 By the light of tabletop candles, you can order off wooden menus etched with that signature lightning bolt font that Potterheads will recognize the moment they see it. One of the items on that menu is the Goblet of Fire. No, really. 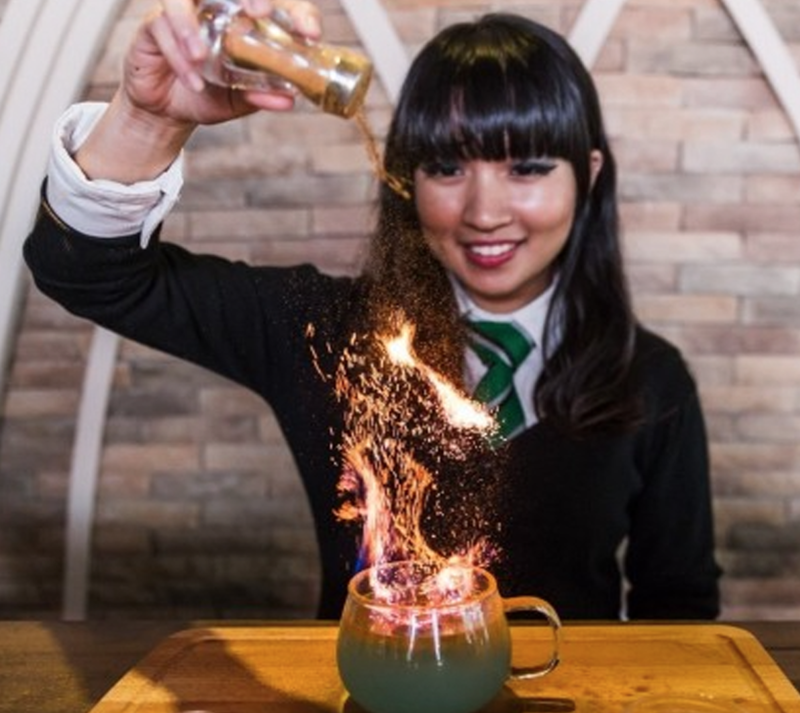 An actual witch or wizard will come to your table and pour Bacardi into blue Curacao before waving their wand — more like blowtorch — to set it aflame. Before you leave, grab a wand and pointed hat for a photo op so you can prove to the internet that you really crossed over to the wizarding world. Pre-obliviated Gilderoy would be thrilled that he's enough of a celebrity for a bar in the Muggle world to be named after him. He probably would be bummed at this Toronto bar’s décor, though, because there isn't a single painting of him flashing that obnoxious grin. Its crest is a bleeding stag head with a keyhole eye, a slightly creepy homage to Harry's patronus and the forbidden door Hermione opened by whispering "Alohomora." The bar is totally something Snape would approve of, from the "Potions & Elixirs" bar to the curious arrangement of bottles right out of his dungeon. You won't miss the Polyjuice Potion. There's Befuddlement Draught, a fruity concoction that might make you a little hazy, and (of course) Better Beer, a magical elixir of advocaat, cinnamon-infused toasted butter-washed Sauza, house ginger beer, ginger ale, whipped cream, and toasted marshmallow. It does come in pitchers. Spoiler alert: a neon heart on the wall illuminates the last words in the Harry Potter series. 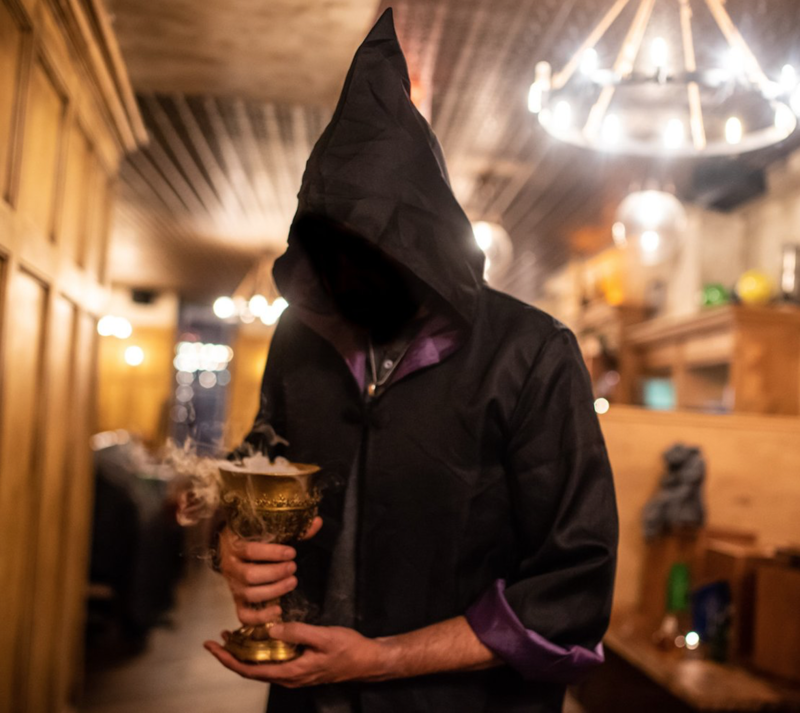 This pop-up bar that just materialized in NYC is more of a Potions class than somewhere you can just casually park your broomstick in. Getting there is a bit like maneuvering through Diagon Alley. You have to levitate or, if you're a muggle, take the stairs to the second floor of Baaria Bierhaus, where you will be handed wizarding robes and a wand from their handcrafted collection that may or may not be from Ollivander's. Then the witchcraft begins. While you may not need any bezoars or wormwood for these potions, you will have pages of eerie handwritten instructions while potion masters drift around the room in case you have no idea what might make the room explode. While that probably won't happen, you can mix gin and lavender into a Transfiguration Toniq that changes color, or stir rum and chai in a bubbling cauldron until you get Lost Time. There are even wand-activated taps you can get more mystical tonics from, like the gargoyle's mouth that spews out honey mead. The Cauldron will vanish after December 31, so accio tickets! Come in, put on a robe, let your wand choose you, and sip on Butterbeer while getting lost in a book. The Nook's cozy atmosphere makes it kind of like a House common room where it doesn't matter whether you're a Gryffindor or a Slytherin — though there is a Sorting Hat in case you're not sure where you belong. There are rows and rows of books, cushions to sink into, and enchanting views of Hogwarts, Diagon Alley and Hogsmeade on the walls, so you can really feel like you've left the Muggle world for a while. Cosplay is always welcome. There are other magical things to be had besides Butterbeer (hot or iced). Think Golden Snitch truffles, bubble teas, frappes, and those towering milkshakes that are all the rage in the Muggle world right now. Of course, there's also a Butterbeer cupcake. And a Butterbeer float. There has to be. Oh, and those Golden Snitch truffles? Covered in edible gold, of course.